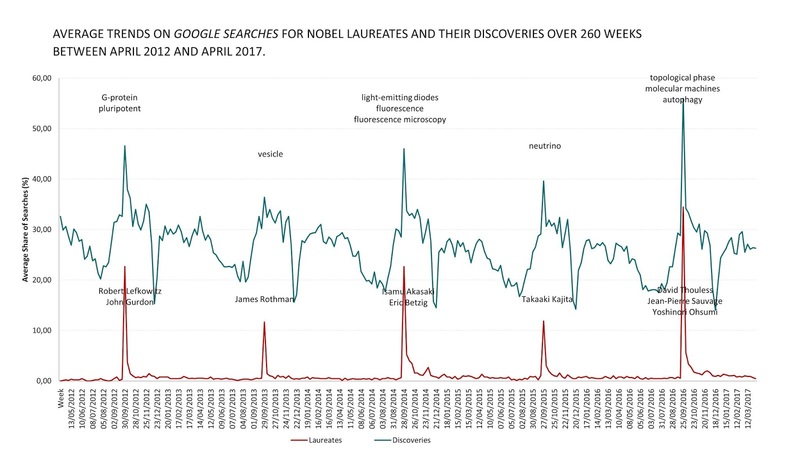 When and why do people Google Nobel Prize winners and their discoveries? Most people turn to the internet, and specifically to Google, for their scientific information needs. But why would they need scientific information in the first place? What types of information are they looking for? One reason would be to follow up on news coverage of a natural disaster, a celebrity illness, an epidemic or prominent scientific events. In our newest study published in Public Understanding of Science, we explored how Nobel Prize announcements trigger global and local searches for the Nobel laureates and their related discoveries. We call these short periods after media announcements of scientific events “teachable moments” since during this window of opportunity users often manifest greater interest in the underlying science. We measured the duration of these teachable moments using the “half-life” of searches on Google, which is the duration it takes for searches to drop to 50% of their peak intensity, based on data available on Google Trends. The associated Wikipedia entries are also popular during these teachable moments. Users not only tend to look for information about the laureates and their discoveries on Google but also visit Wikipedia pages to learn more about these scientific topics. Searches performed from 2012 to2017 show that Nobel Prize events clearly trigger more searches for laureates. 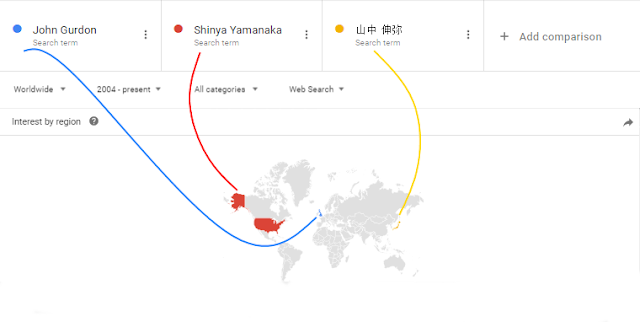 More importantly, they also show an increase in searches for their respective discoveries. For example, the announcement of Nobel laureate Robert Joseph Lefkowitz triggered more Google searches for G-protein, his related discovery. The teachable moment for Nobel Laureates can often last only one day but the teachable moment for their discoveries is much longer. This is partly because online searches for Nobel prize-related discoveries display seasonal trends that correspond to the academic year. In other words, students search for scientific terms on Google throughout the academic year with noticeable breaks during the summer and winter holidays. For instance, the search trends for “fluorescence” illustrate this pattern. Similar to the Eurovision Contest and the Olympics, the Nobel Prize is a national competition and not only an international event. The proportion of searches from the laureates’ countries is often much higher than in other countries since national pride plays a considerable role in searches for laureates who live or were born in countries that do not regularly receive Nobel Prizes. The Turkish-American biochemist and molecular biologist Aziz Sancar, for example (Chemistry 2015), was the focus of many searches from Turkey, where he was born, dwarfing searches for his two US and Swedish-born British fellow laureates. Searches for Nobel Prize laureates in Physiology or Medicine 2012 showed that the proportion of searches for "Shinya Yamanaka" in Japanese (山中 伸弥) (which was the highest in Japan) far exceeded the proportion of searches for "Shinya Yamanaka" in English, which was used by almost the rest of the world and was highest in the US. Similarly, searches for the British biologist John Gurdon were the highest in the UK. The Nobel Prize in Physics 2013 tells a similar story. In Belgium, the proportion of searches for the scientific term 'boson' and searches for the Belgian theoretical physicist 'Englert' were almost identical in 2013. In neighboring France, however, searches for the scientific term 'boson' were considerably higher than for 'Englert'. The Swedes are particularly proud to be the home of the Nobel Prize and Sweden is the country with the highest proportion of searches for Nobel Prize awards. They also find the ceremony to be more interesting than the announcement, and the search term 'Nobel' emerges almost as frequently as the term ‘vetenskap’ - ‘science’ in Swedish. Ayelet Baram-Tsabari is Associate Professor at the Faculty of Education in Science and Technology at the Technion – Israel Institute of Technology. She founded the Israeli Science Communication Conference series, serves as a member of PCST scientific committee, and is an elected member of the Israel Young Academy. 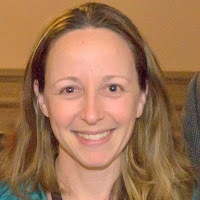 She is a member of the Advisory Board for the US National Academy of Sciences’ new Koshland public engagement program, and a member of the Israeli Centers of Research Excellence (I-CORE) program on “Learning in a Networked Society” and “Taking Citizen Science to School,” among her other professional activities. Her research focuses on bridging science education and science communication scholarship, identifying people’s interests in science, and supporting scientists in becoming effective science communicators. Elad Segev is Associate Professor of Digital Media and Communication at the Department of Communication, Tel Aviv University. His work centers on the relationship between information and power from different cross-national perspectives, including culture and national identity, Americanization and globalization, international news flow, information search and search strategies, the digital divide, network analysis, data mining, and new applications and methodologies in social science and communication.